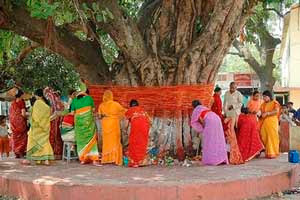 Why Hindus Tie Cotton Threads Around Trees? Cotton Threads of various colours like red, yellow and white are tied around Pipal tree trunks especially in Northern and Western parts of India. This ritual is performed especially on the Vat Savitri puja day (May – June). During Vat Savitri Puja, the Banayan or Pipal Tree symbolically represents Brahma, Vishnu and Shiva. The root of Vat Vriksha is Brahma, the stem is Vishnu and the upper part is Shiva.